As time passes, the artificial reefs become part of the underwater landscape. What is underwater and giving Collier County an economic boost? The Artificial Reef Project! Deployed in January 2015, this combined effort of the City of Naples, Collier County and Marco Island, along with the Florida Fish and Wildlife Conservation Commission, the U.S. Army Corps of Engineers and the National Oceanic and Atmospheric Administration (NOAA) has placed a total of 36 reefs at six different sites in our coastal waters. A packed house at the Rose History Auditorium was recently treated to a presentation on this project by Katie Laakkonen, Environmental Specialist for the City of Naples. Before turning the stage over to Laakkonen, naturalist and Stepping Stone Ecotours founder Bob McConville welcomed the crowd with the words “Go take a hike!” – encouraging all to explore the Big Cypress National Preserve and its boardwalk tours. After three months the materials have become part of the underwater habitat. this underwater habitat. 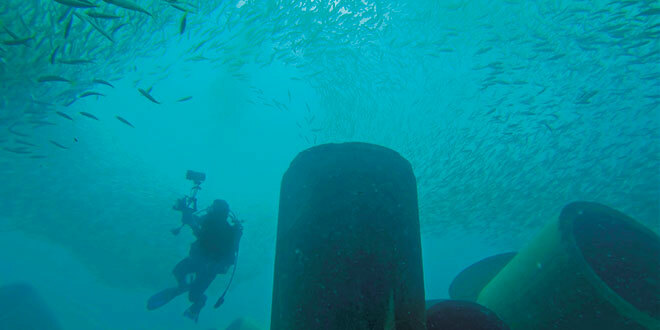 A diver on the team that initially surveyed the Gulf’s surface for this project, her photos and fascinating videos submerged us in an exploration of marine vegetation, invertebrates and fish. You may wonder why the project is so important to Southwest Florida. The artificial reefs improve the health of the Gulf of Mexico as sea life recruits naturally onto each reef. Each reef ends up with its own unique habitat. The reefs’ presence will improve fishing and diving opportunities. This win-win situation provides a socio-economic benefit by increasing tourism, adding more jobs in many sectors, and bringing opportunities for marine research. Above water, materials being dropped into the Gulf to create the artificial reef. federal waters, and are permitted by the U.S. Army Corps of Engineers. Strict regulations exist regarding height, length and depth of each reef in relationship to the total water column depth at mean low water (MLW). The reefs cannot be located in a shipping lane. Post-deployment monitoring is conducted for the evaluation of reef stability and diversity of habitats. Some of the materials used in the reef construction were donated by Florida Power and Light and some were purchased from Big Cypress. The project was funded by BP’s Gulf Tourism and Seafood Promotional Fund, better known as the BP Gulf Oil Spill Fund, and private donations through the Community Foundation of Collier County. Originally known as the Marco No. 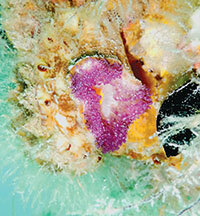 2 Reef, the Rooney Reef is located 26.6 nautical miles from Marco Pass. It was privately funded by the Francis Rooney family. Kathleen Rooney was present at the Rose History Auditorium for the evening’s presentation. like the world above water, the reefs do have one visitor to their habitat that behaves like a bully. The lionfish is an ambush predator that does not exist naturally in the Gulf of Mexico. A popular aquarium fish, it is believed to have invaded our waters by being released by owners no longer wanting them. They have a voracious appetite and will eat everything on the reef, particularly juvenile marine life. If seen, experienced anglers have speared them, but one must be careful in doing so as they have venomous spines. To learn more about the Artificial Reef Project, please visit the artificial reef page at www.naplesgov.com. To see Paradise Reef, a PBS documentary on this project, please visit video.wgcu.org/video/2365794811.